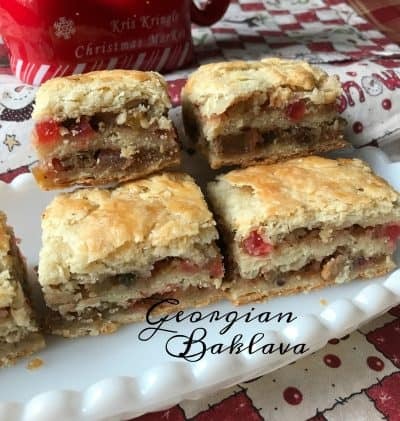 Georgian Baklava or Pakhlava is a delicious dessert found in many restaurants and delis around the world. Many countries can claim the bragging rights to this sweet dessert because the history of Baklava is not well documented. The name is Turkish in origin and the dish is believed to have originated during the Ottoman Empire. Baklava or Pakhlava is made of many layers of phyllo dough, spices such as cardamom or cinnamon and chopped nuts like pistachios. Baklava pronounced [BAHK-lah-vah; bahk-lah-VAH] is popular in Greece and Turkey, this sweet dessert consists of many layers of butter-drenched phyllo pastry, spices and chopped or ground nuts. A spiced honey-lemon syrup is poured over the warm pastry after it’s baked and allowed to soak into the layers. Before serving, the dessert is cut into triangles and sometimes sprinkled with coarsely ground nuts. 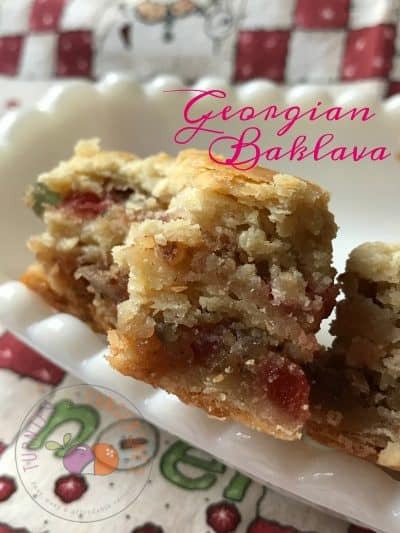 Pakhlava, also known as baklava is a rich, sweet pastry made of layers of phyllo, a thin unleavened dough filled with chopped nuts, sweetened and held together with syrup or honey. It’s a staple of Turkish cuisine and is also found in Central and Southwest Asia. 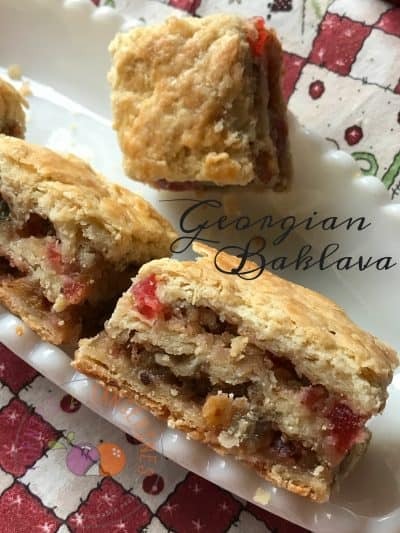 This sweet pastry is very popular in Georgia as well. 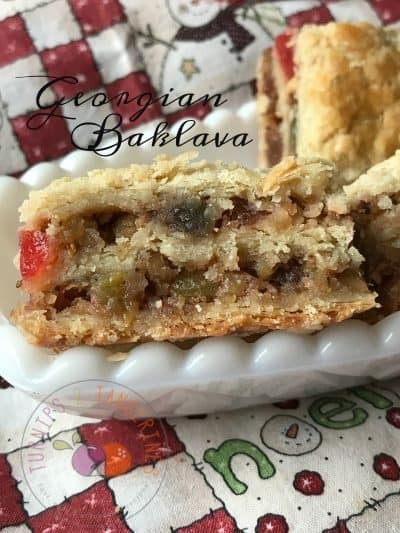 Georgian Pakhlava is a delicious dessert and our version is made with dried chopped fruit as well as ground nuts. Phyllo pronounced [Fee-loh] literally translated, the Greek word phyllo means “leaf.” In culinary terms it refers to tissue-thin layers of pastry dough used in various Greek and Near Eastern sweet and savory preparations, the best known being Baklava and Spanakopita. Phyllo also spelled fillo, is very similar to strudel dough. Packaged fresh and frozen, phyllo dough is readily available. Fresh can be found in Greek markets and frozen in most, if not all, supermarkets. Unopened, phyllo can be stored in the refrigerator for up to a month. Once opened, use within 2 to 3 days. Frozen phyllo can be stored for up to 1 year. Thaw the dough overnight in the refrigerator. Refreezing phyllo can make it become brittle. Due to the difficulty in making phyllo dough at home, most people prefer to purchase phyllo dough. Athens is probably the most recognizable brands of phyllo dough and can be purchased just about anywhere. 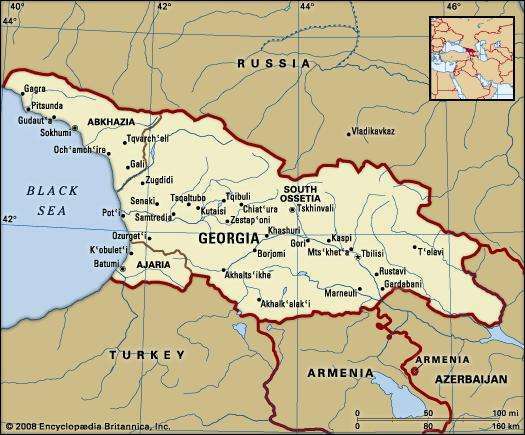 Georgia, Georgian Sakartvelo, country of Transcaucasia, is located at the eastern end of the Black Sea on the southern flanks of the main crest of the Greater Caucasus Mountains. It is bound on the north and northeast by Russia, on the east and southeast by Azerbaijan, on the south by Armenia and Turkey, and in the west by the Black Sea. The capital of Georgia is Tbilisi. A delicious mixed fruit filling made with Paradise Fruit. Keyword: butter, Christmas, dried fruit, nuts, Paradise Fruit Co.
Place flour and baking soda in a large bowl; stir to combine. Cut butter into flour mixture with pastry blender or two knives until mixture forms pea-sized pieces. Reserve 1 egg yolk in cup; cover with plastic wrap. Add remaining yolk and sour cream to flour mixture; toss with a fork until mixture holds together. Form dough into a ball; wrap in plastic wrap and refrigerate 2 hours or until firm. Meanwhile, for filling, combine dried fruit with Bourbon or Brandy and vanilla extract in a medium bowl. Set aside and let sit 90 minutes. Stir in ground walnuts, sugar and ground cinnamon. Let sit 30 minutes longer. Beat egg whites in a clean large bowl with electric mixer at high speed until stiff peaks form. (After beaters are lifted from egg white mixture, stiff peaks should remain on the surface and when bowl is tilted, mixture will not slide around. Gently fold in fruit mixture with rubber spatula by gently cutting down to the bottom of the bowl, scraping up the side of the bowl, then folding over the of the mixture. Repeat until fruit mixture is evenly incorporated into the whites. Remove top sheet of waxed paper from one dough square. Invert dough into bottom of baking pan. (You may have to trim dough to fit pan.) Remove second sheet of waxed paper. Add water to reserved egg yolk; beat lightly with fork until foamy. Brush dough with egg yolk mixture. Spread half of fruit mixture on dough. Repeat procedure with second dough square, egg mixture and remaining fruit mixture. Cover with third dough square; turn edges under for a neat appearance. Preheat oven to 350 degrees. Score top of dough into diamonds by making lengthwise diagonal cuts, just through top layers of dough, every 1 1/2 inches, with sharp knife. Make crosswise horizontal cuts, just through top layers of dough, to form diamond shapes. Brush dough with remaining egg yolk mixture. Bake 45 minutes or until browned. Remove pan to wire rack; cool completely. Cut bars all the way through with serrated knife; carefully lift bars out of pan with thin flexible spatula. Store tightly covered in single layer. Makes about 2 1/2 dozen bars. *For this recipe we used a mixture of Paradise candied dried red and green cherries, pineapple and lemon peel. We also used golden raisins. Paradise Fruit Co. and Sun Maid . 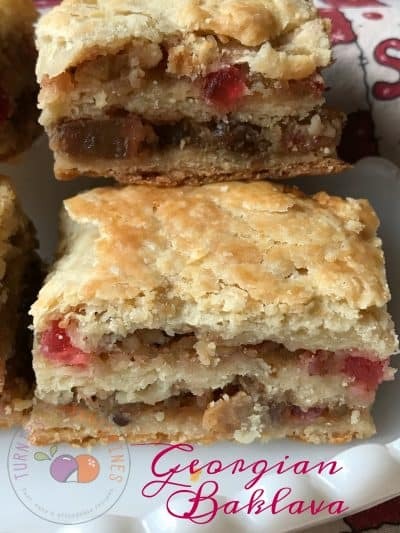 Welsh Tea Cakes or Snickerdoodle Cookie is another fantastic recipe using Paradise Candied Dried Fruit.